Not only does Bo put everyone on the ground (including all the police who had conveniently gathered in one place), but Hades then raises these people as his own little slaves – I think this is raising the dead but not mainly because the show doesn’t want Bo to have actually killed the city of Toronto (because that would require one hell of a redemption train). Of course the good guys are all kind of doubting and worried about what this means and Bo going dark – but Kenzi is adamantly pro-Bo throughout. Because she’s Kenzi and that’s who she is. They’re also protected by this surprisingly multi-purpose horseshoe which stops them being among the drained and enslaved masses and also stops bullets fired by said drained and enslaved masses. It’s a pretty nifty horseshoe but since it was forged by the gods we can’t exactly argue against that. Actually, aside here – this whole episode contains a lot of moments of Bo’s gang working together despite their previous squabbles (usually over Bo). Dyson and Lauren, Lauren and Tamsin, they all find a level together without any of the bad blood rising. Bo is now back on team good guy and ready to fight just as they have 3 different issues rising: Tamsin’s water breaks and she goes into labour, helped by Lauren and Kenzi. Hades arrives and Bo confronts him. And the possessed elders attack (who are held off by Dyson, Mark and Vex… which is a little dubious that these 3 can hold off twelve of the most powerful fae… except that we’re reminded that, under the comic relief, back in the early seasons Mesmers were considered some of the most terrifying fae out there). Bo faces Hades in what is probably the weakest part of this episode – she makes Tamsin’s points about being good as well as evil and about the importance of love… and that seems to banish him. I’m not entirely sure what happened here or what was supposed to - I think we have the Power of Love again: and this time all sarcasm is certainly intended. But we still have tragedy: Valkyries die in childbirth. So though we have a beautiful goodbye scene and Tamsin and Bo have a beautiful moment and Tamsin’s death as she explains Valkyries call their last death “Rising” is all so very very beautiful – she does die, leaving her daughter behind. Which Bo entrusts to Kenzi to raise, safe among humans as Trick did to her: but promising they would watch and care for her, that she wouldn’t become a Lost Girl like Bo did. Fast forward a few years to that daughter as a teenager (we don’t know how long as she ages rapidly like Tamsin and other Valkyries) and, after making out with another woman (proving if there is another Lost Girl spin off, the number of bisexual and lesbian women will continue) is brought into the gang, introduced to them all: because Hades mark has appeared on her and he’s coming for her. Going by what season 4 left them, season 5 was a masterful act of storytelling. I still think the Olympians were poorly used and Hades under-developed and established but it worked and we did get a coherent story out of it without completely rebooting the last season and I really have to praise that. I’m also going to praise Bo and Lauren together – for a long time Bo and Lauren’s relationship has been shaky. It started with a whole lot of problems, their relationship being one of deception and coercion from the beginning. Then there was Dyson repeatedly being presented as the better choice, the death of Lauren’s girlfriend in a terrible manner and then Lauren and Bo can’t possibly work because HUMAN (unlike Dyson). I didn’t expect it to go well – and it didn’t – which means I’m really really happy that after so many trainwrecks we do end with them together, against all the odds and all expectations. Kudos, Lost Girl, you didn’t leave us with Bo/Dyson as we expected. 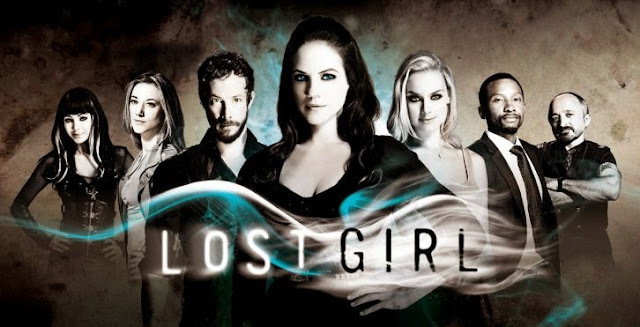 I’m not going to praise Lost Girl for it’s racial inclusion though – it has never been good and its only got worse. Mark was under-developed, Hale abysmally treated and then dismissed and Nyx atrociously treated and used – the racial inclusion of this world is terrible and has been for five seasons. There’s been no real step up at all which is depressing to say the least. I suppose I should mention Vex and Mark holding hands – but really it’s not worth mentioning. In a show that has so much open and clear sexuality between men and women and women and women, two men *gasp* holding hands with zero relationship? Nahhh, not worth any points.